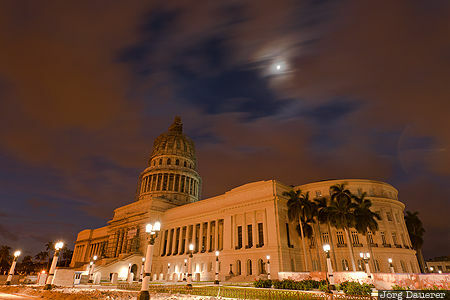 The flood-lit El Capitolio (or National Capitol Building) in Havana below fast moving clouds and the setting moon above at the blue hour before sunrise. Havana (or La Habana) is the capital of Cuba. This photo was taken in the morning of a sunny day in February of 2016. This photo was taken with a digital camera.